Francis Anthony Fucile was born in Philadelphia Pennsylvania on November 19, 1929. He grew up at 9th and Morris in South Philly with his brother Joe and his parents, Giuseppe and Domenica. His parents worked in the garment industry and worked hard to send him to La Salle prepatory school and College. In 1953 he was drafted into the U.S. Army during the Korean conflict and served his country performing research at defense laboratories in Utah. After his honorable discharge he began medical school back home in Philadelphia, PA at the Philadelphia College of Osteopathy. He returned to Florida to intern and serve his medical residency in Miami, Florida. Eventually he established his own medical practice as a family doctor in Miramar, Florida. In 1963 he met Karen Marie Cinotti on a blind date. Two years later they were married at Little Flower Church in Hollywood, Florida. In 1968 Karen and Frank adopted their first son Joe and two years later their only daughter Connie. In 1974 Karen gave birth to a son Frankie and in 1976, Anthony (Nino) was born. Dr. Fucile loved boating and fishing. The family took wonderful vacations to the Florida Keys and to the Bahamas where they lived on the family boat and all got to experience first hand Frank’s love of the ocean. Dr. Fucile took his calling as a “family doctor” truly to heart. He was loved by his patients and fellow doctors. They became his closest friends and even family as God parents to his children. 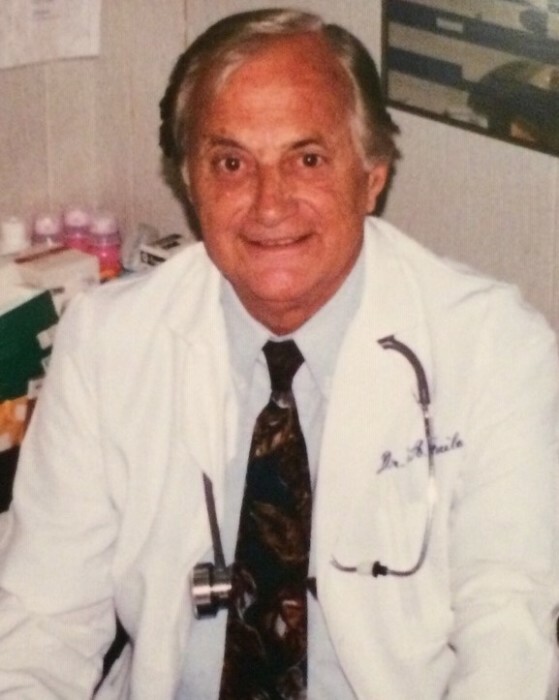 After 45 years of practicing medicine Dr. Fucile retired in 1993. Retirement didn’t really suit his active nature and he eventually decided to work part-time as a ships’ doctor for Carnival Cruise Lines finally combining his love of medicine with his love of the sea. Working on the ships re-kindled Frank and Karen’s love of traveling and together they planned amazing trips to Italy for their children and friends. In 2002, during one of these trips they visited Mt. Etna in Sicily and Frank, at age 73, climbed to the summit of the volcano at approximately 9,000 feet elevation. While Frank was at FSU he had participated in the founding of the FSU chapter of Lamda Chi Alpha Fraternity. As they enjoyed semi-retirement Frank and Karen would travel to FSU football games and Lamda Chi alumni events at FSU and the University of Central Florida where his son Frankie had also joined Lambda Chi. Karen and Frank had settled into their vacation retreat home on Cocoa Beach, Florida where they loved hosting countless vacations and holidays for their children and their children’s growing families. In July 2015 Karen and Frank celebrated their golden wedding anniversary surrounded by friends and family including their four children and nine grandchildren. Frank’s health continued to decline and, after an extended battle with congestive heart failure, he passed on peacefully at home in the arms of his loving wife and children. Frank is celebrated by his wife Karen, his children (daughter Connie Nelson of Pensacola Florida, and sons Joe of Atlanta, GA, Frank of Palm City, FL and Anthony of Cocoa Beach, FL) and his nine grandchildren (Devon, Sydney, Kendall, Owen, Bella, C.J., Gianni, Logan and Piper).